Oxidative stress has been demonstrated in malaria. 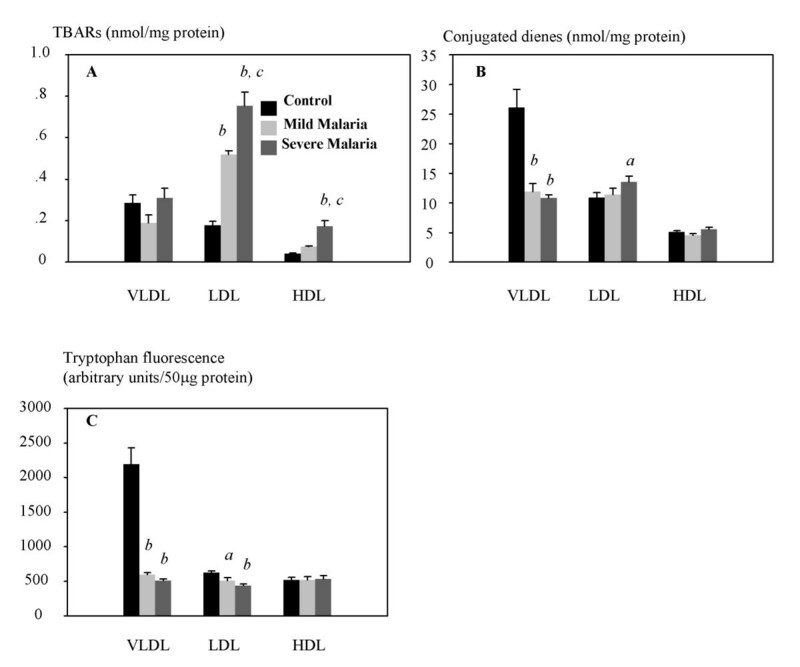 The potential oxidative modification of lipoproteins derived from malaria patients was studied. These oxidized lipids may have role in pathogenesis of malaria. The plasma lipid profile and existence of oxidized forms of very low density lipoprotein (VLDL), low density lipoprotein (LDL) and high density lipoprotein (HDL) were investigated in malaria (17 mild and 24 severe patients) and 37 control subjects. Thiobarbituric acid reactive substances (TBARs), conjugated dienes, tryptophan fluorescence and fluidity of lipoproteins were determined as markers of oxidation. The biological effect of malarial lipoproteins was assessed by the expression of adhesion molecules on endothelial cells. Malarial lipoproteins had decreased cholesterol (except in VLDL) and phospholipid. The triglyceride levels were unchanged. 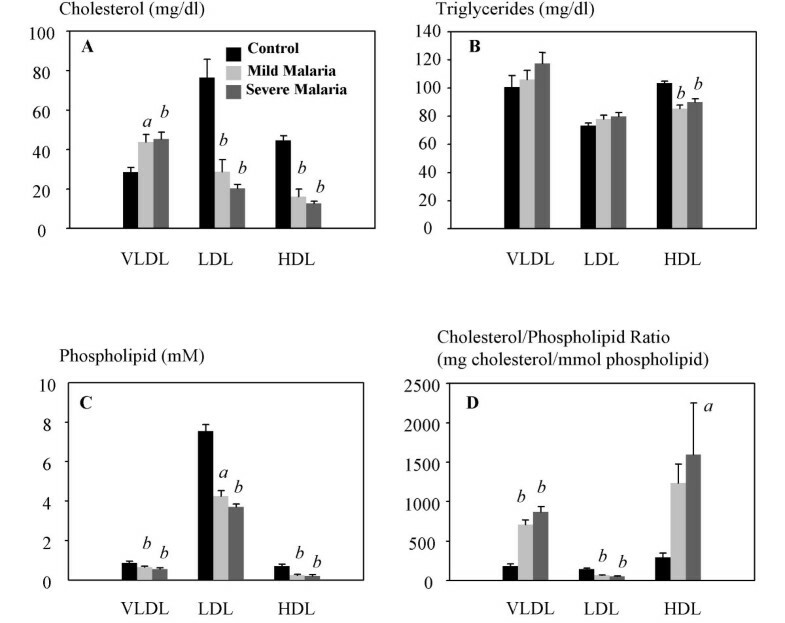 The cholesterol/phospholipid ratio of LDL was decreased in malaria, but increased in VLDL and HDL. TBARs and conjugate dienes were increased in malarial lipoproteins, while the tryptophan fluorescence was decreased. The fluidity of lipoproteins was increased in malaria. These indicated the presence of oxidized lipoproteins in malaria by which the degree of oxidation was correlated with severity. Of three lipoproteins from malarial patients, LDL displayed the most pronounced oxidative modification. In addition, oxidized LDL from malaria patients increased endothelial expression of adhesion molecules. In malaria, the lipoproteins are oxidatively modified, and the degree of oxidation is related with severity. Oxidized LDL from malarial patients increases the endothelial expression of adhesion molecules. These suggest the role of oxidized lipoproteins, especially LDL, on the pathogenesis of disease. The existence of oxidative stress during acute malaria infection has been demonstrated previously, including depletion of antioxidants , increased plasma lipid peroxidation and altered fluidity of erythrocyte membrane . The oxidative stress results from host immune reaction, as an acute phase response, and the intraerythrocytic parasite's metabolic processes . Although the oxidative stress appears to be a common phenomenon in acute infection, it may cause a specific consequence in malaria pathogenesis. For example, previous data demonstrate that peroxynitrite arising from reaction of nitric oxide with superoxide radical is one of cytotoxic molecule from macrophage against Plasmodium falciparum, and it has been suggested that compromising nitric oxide metabolism may involve in severe malaria complication . Of interest, cytoadherence of the infected erythrocytes is enhanced through oxidation of redox-sensitive CD36 . Taken together, there appears a possibility that the parasite takes advantage of oxidative stress to increase its pathogenic properties such as cytoadherence. Lipoproteins are major lipid component in plasma, and certainly targets for oxidative stress. During malaria infection, the levels of LDL and HDL are decreased while triglycerides are moderately increased [6, 7]. In low-level malarial infection, the levels of total cholesterol, LDL and HDL are reduced while triglyceride levels are increased . These events may be related to the oxidation, and they are in consistent with the fact that host response to acute infection increases lipoprotein oxidation in vivo . However, the presence and significance of oxidized lipoproteins in acute malarial infection have not been clarified. The vascular endothelial cells play a pivotal role in pathogenesis of malaria infection, especially cytoadherence of the infected erythrocytes on endothelial cells. The expression of adhesion molecules on endothelial cells is partly regulated by reactive oxygen species and oxidized LDL . The oxidative stress may regulate the functions of vascular endothelium via reactive oxygen species or bioactive products of lipid peroxidation . This may result in alteration in the levels of adhesion molecule expression on endothelial surface and then increase the cytoadherence of the infected erythrocytes. In this study, it is hypothesized that oxidative stress in malaria may modify the circulating lipoproteins, and the oxidatively modified lipoproteins derived from malaria patients may subsequently affect the levels of expression of adhesion molecules on endothelial cells. The clinical data of 41 malarial patients (17 mild and 24 severe cases) on admission are given in Table 1. According to the WHO criteria, the patients are classified as mild and severe malaria groups. 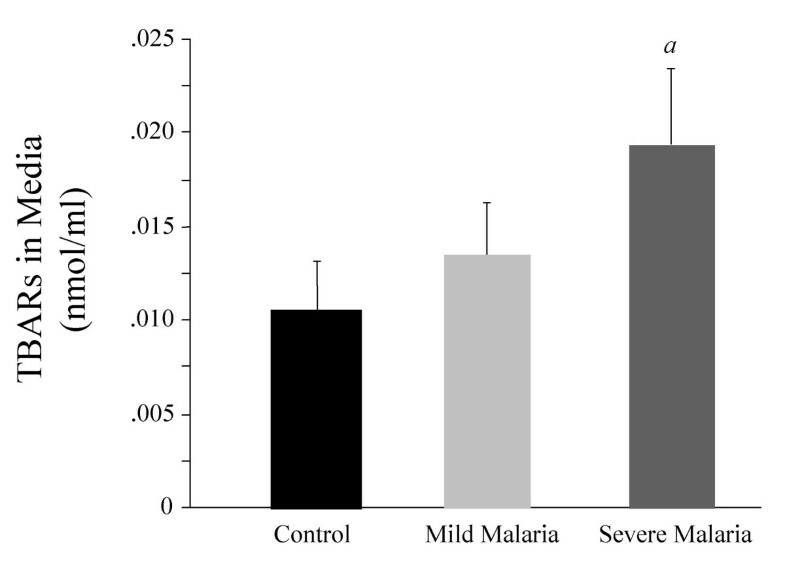 The mean age of normal subjects (34, n = 37) is higher than those of mild and severe malarial subjects (27, n = 41) (P < 0.05). There is no difference in age between mild and severe malaria. Values are mean (median, minimum and maximum) or number. *Geometric mean. The lipid constituents, especially cholesterol and phospholipids, reflect the physical state of the lipoproteins. Thus, the levels of cholesterol, triglyceride and phospholipid in lipoproteins were initially determined (Figure 1A,1B,1C,1D). The VLDL-cholesterol levels were significantly higher in malaria than in control. In contrast, the LDL- and HDL-cholesterol levels were lower in malaria than in control. Notably, the severe cases exhibited more significant change in cholesterol levels than in mild cases. The HDL-triglyceride levels were reduced in malaria while these values of VLDL and LDL were not significant difference among groups. In malaria, the phospholipid contents were reduced in all three fractions. The more significant change in LDL-phospholipid was observed in severe cases than that in mild cases. The cholesterol/phospholipid ratio was increased in VLDL and HDL from malaria patients while this ratio of LDL was decreased in malaria. Lipoprotein composition in VLDL, LDL and HDL. A: Cholesterol. B: Triglycerides. C: Phospholipid. D. Cholesterol/phospholipid ratio. aP < 0.05 and bP ≤ 0.001 as compared with normal. Values are mean ± SEM. The oxidative status of lipoproteins was determined as TBARs, conjugated dienes and tryptophan fluorescence (Figure 2A,2B,2C). The levels of TBARs in LDL were increased significantly in malaria as compared with control, and more significance was observed in severe cases. The LDL-TBARs in severe cases were also significantly higher than those in mild cases. The HDL-TBARs were increased in severe cases, but unchanged in mild cases. There was no change in VLDL-TBARs during malarial infection. Markers of oxidation in lipoproteins. A: TBARs. B: Conjugated dienes. C: Tryptophan fluorescence. aP < 0.05 and bP ≤ 0.001 as compared with normal. cP < 0.05 as compared with mild malaria. Values are mean ± SEM. Only LDL from severe malaria showed increased conjugated dienes levels while VLDL-conjugated dienes from malaria patients appeared lower than those from control. No change was observed in HDL fraction. The tryptophan fluorescence in 50 μg protein was measured further as an index of protein oxidation. The excitation and emission slit for measurement in VLDL and LDL were both 10 nm. Due to the higher protein content in HDL, the excitation and emission slits were adjusted to be 10 and 5 nm, respectively. In VLDL, the tryptophan fluorescence was markedly reduced (73% reduction in mild and 77% reduction in severe patients). As well, the tryptophan in LDL was reduced (18% and 30% reduction in mild and severe patients, respectively). However, the tryptophan fluorescence of HDL remained unchanged. The lipoprotein fluidity was determined by steady-state fluorescence anisotropy of DPH and fluorescence energy transfer from tryptophan to pyrene (Figure 3A,3B,3C). 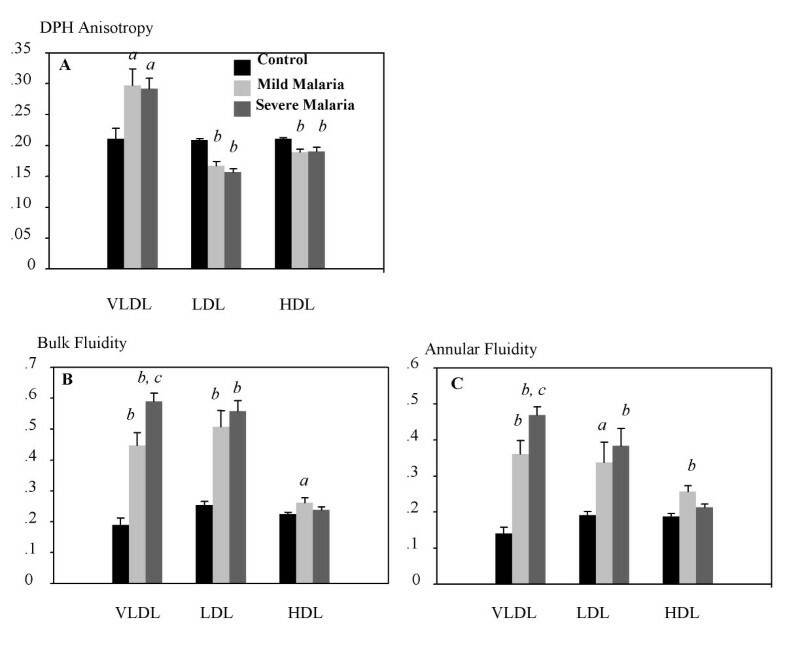 As determined by DPH anisotropy, LDL and HDL obtained from malarial patients, both in mild and severe cases, displayed higher fluidity (lower anisotropy) than those from control subjects. The bulk and annular fluidity of LDL was similarly increased in malaria. Only HDL from mild malaria displayed increased bulk and annular fluidity. VLDL from malarial patients displayed lower fluidity than that of control when measured by DPH anisotropy, but by using pyrene as a probe, the fluidity was higher in malaria than in control subjects. Lipoprotein fluidity. A: DPH anisotropy (reciprocal to fluidity). B: Bulk fluidity. C: Annular fluidity. aP < 0.05 and bP ≤ 0.001 as compared with normal. 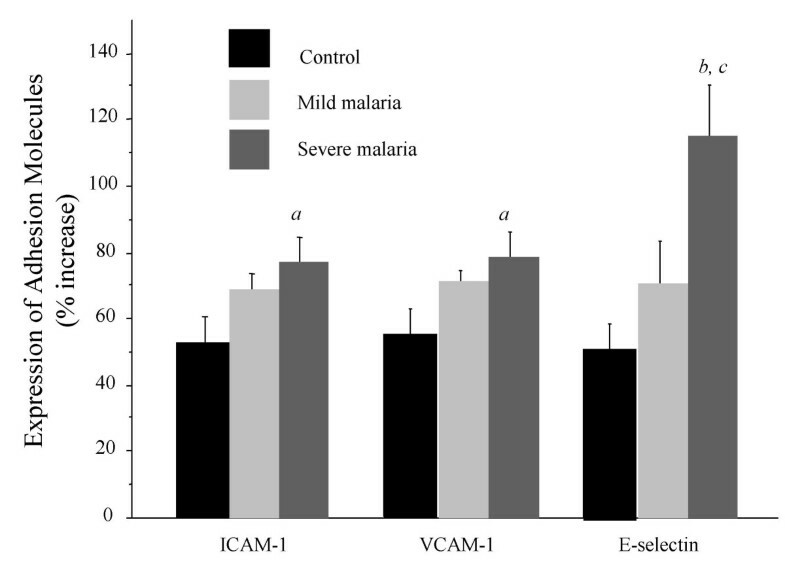 cP < 0.05 as compared with mild malaria. Values are mean ± SEM. To study the effect of oxidized LDL obtained from malarial patients on endothelial cells, confluent culture of human umbilical vein endothelial cells (HUVEC) were exposed for 24 hours to medium containing 30 μg/ml protein of LDL. LDL obtained from severe patients significantly increased the expression of ICAM-1, VCAM-1 and E-selectin on HUVEC (Figure 4). There were increased TBARs levels in the media containing LDL from the severe patients (Figure 5). The increased expression of adhesion molecules on HUVEC was correlated with the TBARs in medium (for ICAM-1, r = 0.54, P < 0.0001; for VCAM-1, r = 0.55, P < 0.0001; for E-selectin, r = 0.57, P < 0.0001). Likewise, there was correlation between LDL TBARs and expression of ICAM-1 (r = 0.40, P = 0.01), VCAM-1 (r = 0.39, P = 0.01) and E-selectin (r = 0.61, P < 0.0001). Effect of LDL on HUVEC expression of ICAM-1, VCAM-1 and E-selectin. aP < 0.05 and bP ≤ 0.001 as compared with normal. cP < 0.05 as compared with mild malaria. Values are mean ± SEM. TBARs levels in media after 24-hours incubation of LDL and HUVEC. aP < 0.05 as compared with normal. Values are mean ± SEM. In addition to the greater change of lipoproteins in severe patients than in mild patients as described above, the correlation of TBARs in lipoproteins and disease severity was analyzed and summarized (Table 2). TBARs in lipoproteins were found to correlate with markers of disease severity. Furthermore, the correlation between lipoprotein composition and fluidity was calculated in order to discuss the possible factors responsible for fluidity change. Seemingly, lipoprotein fluidity was correlated with cholesterol content (especially LDL and HDL), triglyceride and cholesterol/phospholipid ratio rather than TBARs (Table 3). TBARs in LDL showed significant correlation with cholesterol content (r = -0.43, P = 0.0044) and DPH anisotropy (r = -0.42, P = 0.0054). Significant correlation was found between annular fluidity and tryptophan fluorescence (r = -0.60, P < 0.0001; r = -0.66, P < 0.0001; r = -0.54, P = 0.003 for VLDL, LDL and HDL respectively). As well, the expression of adhesion molecules displayed relationship with LDL TBARs (r = 0.40, P = 0.01; r = 0.39, P = 0.01; r = 0.61, P < 0.0001 for ICAM-1, VCAM-1 and E-selectin respectively), and TBARs in media (r = 0.40, P = 0.01; r = 0.41, P = 0.01; r = 0.56, P = 0.0002 for ICAM-1, VCAM-1 and E-selectin respectively). Correlation between lipoprotein oxidation and disease severity. Values are correlation coefficients (P-value). Correlation between fluidity and lipoprotein composition or TBARs. Oxidative stress is related to the severity of malaria as measured from the plasma parameters [1, 2, 12], but the LDL oxidation have not been identified. In this study, the existence of oxidized lipoproteins during malarial infection is reported for the first time in different fractions of lipoproteins. The oxidative modification of lipoproteins as determined by TBARs, conjugated dienes and fluidity changes is also related to the change in lipid parameters and severity. The oxidative stress in malaria may originate from several sources including intracellular parasitized erythrocytes  and extra-erythrocytes as a result of hemolysis and host response [1, 12]. Consequently, the products from oxidative stress or radical species may interact with the mediators involved in pathogenesis of malaria such as nitric oxide [4, 13, 14]. Moreover, the parasite may take advantage of this event to increase cytoadherence in order for immune evasion. The cytoadherence involves interaction between ligands on surface of the infected erythrocytes (mainly the Plasmodium falciparum erythrocyte membrane protein 1, PfEMP1) and endothelial receptors, including CD36, ICAM-1, VCAM-1 and E-selectin [reviewed in ]. In this study, the oxidized LDL can activate endothelial cells and increase levels of expression of adhesion molecule, thus promoting cytoadherence. The oxidized LDL-induced adhesion molecule expression could be mediated through the binding of oxidized LDL to its endothelial receptor (LOX-1 or lectin-like oxidized LDL receptor) and subsequent activation of nuclear factor-κB [16, 17]. In addition, the oxidized LDL and reactive oxygen species may enhance cytoadherence of the PRBC to endothelial cells by a redox-dependent conformation change of CD36 . Upon oxidation, CD36 becomes increased affinity for binding with ligands on PRBC surface. This may promote sequestration and immune evasion, which are important determinants in the pathogenesis of complications of severe malaria. In malaria, alteration of lipid metabolism during acute infection may result from acute phase response . The acute phase response is associated with changes in lipid metabolism including a moderate increase in serum triglycerides and VLDL, but decrease in HDL and LDL . From the present data, it appears that the acute malarial infection is accompanied by proatherogenic changes in plasma lipoprotein profile that comprises increase in VLDL cholesterol and slightly increased VLDL triglycerides, and decrease in HDL cholesterol and HDL triglycerides. These may be explained by the fact that the acute phase response involves a decrease in activity of lecithin-cholesterol acyltransferase (LCAT) . Once oxidized LDL is present, it inhibits this enzyme activity and thus impairs HDL metabolism and reverse cholesterol transport . The increased fluidity is related to a low of cholesterol contents. The cholesterol/phospholipid ratio is reduced in LDL, but increased in VLDL and HDL. These suggest that there are other factors responsible for fluidity changes in addition to the composition. The significant increases in lipid peroxidation and conjugated dienes in lipoproteins are associated with lipoprotein composition. Thus, the increased fluidity is also a result of oxidative process . In addition, the lipoprotein oxidation is also associated with abnormal liver functions which may result in altered hepatic lipoprotein metabolism and oxidation similar to those observed in liver disease . These events altogether result in higher lipoprotein fluidity of malaria patients as in liver disease . Nevertheless, only LDL shows correlation between fluidity as sensed by DPH anisotropy and TBARs, and between cholesterol and TBARs. It is thus possible that LDL oxidation is an initial event that subsequently results in low cholesterol levels and high fluidity. The consequence of altered lipoprotein fluidity may affect their functions and metabolism, for example controlling the activity of lipid enzyme lecithin:cholesterol acyltransferase  or binding affinity for lipoprotein receptors. The difference in VLDL fluidity measured by two different probes, DPH and pyrene, may be explained by means of the orientation and location of probes. DPH is a rod-like structure with axis parallel to the acyl group, while pyrene is spherical and located deeper in hydrophobic end of the acyl group. Based on this fact, the VLDL fluidity reported by DPH represents that change in different lipid domain from that reported by pyrene . Therefore, the change in VLDL may not have as much significance as in LDL and HDL. In conclusion, the present study demonstrates the existence of oxidized lipoproteins in malaria and their relationship with lipid profile and disease severity. The oxidized LDL may play role in pathogenesis of malaria through increasing the expression of endothelial adhesion molecules and cytoadherence. The role and mechanism of oxidized LDL in pathogenesis of malaria require further investigation. Trypsin was purchased from Gibco. Endothelial cell mitogen was from Biomedical Technologies Inc. Collagen A was from Biochrom KG. PE-conjugated Monoclonal antibody ICAM-1 was purchased from Immunotech, France. FITC-conjugated mouse antiHuman VCAM-1 and E-selectin were from Serotec, UK. All of other chemicals were also purchased from Sigma Chemical Co. Patients (n = 41) admitted to the Bangkok Hospital for Tropical Diseases, Thailand with diagnosis of falciparum malaria were recruited for this study. The severity of malaria was defined according to the criteria of WHO . The informed consent was obtained from patients or their relatives. The study was approved by the Faculty of Tropical Medicine Ethical Committees Review Board, Mahidol University, Thailand. On admission, the history of patient was recorded, and the physical examination, routine hematology, parasitemia and blood biochemistry (determined by automate machine, Technicon RA2000) were performed. The control subjects (n = 37) were recruited in the study at the same period with the malarial patients. The blood samples were collected in 10 units of heparin sulphate on admission (before treatment with antimalarial drugs), and delivered to the laboratory within six hours after drawing. The plasma was separated by centrifugation at 1,500 g for 10 min at 4°C. The plasma was stored at -70°C. Separation of plasma lipoproteins was performed within seven days after blood drawing by density gradient centrifugation . VLDL, LDL and HDL were isolated from the plasma by preparative ultracentrifugation using a Beckman LE-80K Ultracentrifuge and a 90Ti Rotor. The isolated LDL was extensively dialyzed using CelluSep® membrane (Membrane Filtration Products, Inc.) against 10 mM PBS at 4°C overnight and stored at -70°C within one week before use. Composition of lipoprotein from the malaria patients and control subjects was determined by measurement of protein, triglyceride, phospholipid and cholesterol. The protein concentration was measured by Lowry's method . Triglycerides and cholesterol were measured by colorimetric method . Phospholipid was determined by iron/trichloroacetic acid/thiourea method . The levels of TBARs (thiobarbituric acid reactive substances) were determined as a marker of lipid peroxidation . Briefly, one milliliter of diluted sample was mixed with 50 mL of 100 mM butylated hydroxytoluene, 1 mL of 10% trichloroacetic acid, 0.5 ml of 5 mM ethylenediamine tetraacetic acid, 1 mL of 8% sodium dodecylsulphate and 1.5 mL of 0.6% thiobarbituric acid in sequence. The mixture was heated at 80°C for 1 hour and then cooled to room temperature. TBARs were determined at 530 nm excitation and 553 nm emission using 1,1,3,3-tetramethoxypropane as an external standard. In addition, the amount of conjugated dienes was calculated using the molar extinction coefficient (ε234nm = 27,000 M-1.cm-1). where GF is the instrumental grating factor (GF = Iv/Ih) and Iv and Ih are vertically and horizontally polarized light, respectively. The fluidity of lipid adjacent to proteins (annular fluidity) and bulk fluidity was also measured by a fluorescent method. Based on radiationless energy transfer from tryptophan of lipoproteins to pyrene and pyrene monomer-excimer formation, the annular and bulk fluidity was used to determined, respectively. Excitation wavelengths were 278 nm for tryptophan and 334 nm for pyrene. Labeling with pyrene was conducted as described previously [22, 29]. Briefly, lipoproteins was added in 10 mM PBS (pH 7.4) with the final volume 2 ml containing 50 μg/ml protein. Samples were incubated at 37°C for 30 minute in darkness, and then the tryptophan fluorescence was measured at 278 nm and 334 nm for excitation and emission, respectively. Afterwards, 2 μL of 1 mM pyrene (dissolved in dimethylformamide) was added. After 1-minute incubation at 37°C with gentle stirring, pyrene was excited at 278 nm, and the fluorescent intensity was recorded at 373 nm (pyrene monomer) and 480 nm (pyrene excimer). Only pyrene located close to the tryptophan was excited, and the annular fluidity was proportional to the ratio of fluorescence intensity of pyrene excimer (Fe) and pyrene monomer (Fm). Again, pyrene was excited at its own wavelength (334 nm), and the Fe/Fm ratio at 334 nm excitation was taken as the bulk fluidity. HUVEC were isolated and cultured as described previously . Cells used for experiments were at passage levels between 2 and 4. HUVEC were cultured in M199 medium containing 10% heat-inactivated fetal bovine serum, 25 mM HEPES, 200 μg/mL endothelial cell mitogen, 10 unit/mL heparin and 20 μg/ml gentamicin. The endothelial cells were cultured in gelatin pre-coated flask at 37°C in 5% CO2. The cells were detached by treating with 0.25 mg% trypsin-EDTA. The endothelial expression of ICAM-1, VCAM-1 and E-selectin was determined after incubation with LDL (30 μg/mL protein) for 24 hours. An aliquot of HUVEC suspension was transferred into 96-well plate (black plate and clear bottom) which was pre-coated with 1:15 dilution of 1 mg/mL collagen A. Dialyzed LDL was sterilized by filtering through low protein binding filter (Millex®-GV 0.22 μm filter unit, Millipore). After exposed with LDL, HUVEC (8,000 cells per well) were washed three times with 0.1% bovine serum albumin in phosphate-buffered saline (0.1% BSA/PBS), and fixed with 0.5% glutaraldehyde at 4°C for 10 minutes. The cells were washed three times, and left in 0.1% BSA/PBS for 45 minutes at room temperature. The dye-conjugated monoclonal antibody to adhesion molecule (titer 1:100) was added to the cells, and incubated for 90 minutes at room temperature. HUVEC were washed finally with 0.1% BSA/PBS three times. The fluorescence intensity was read by LS55 luminescence spectrometer equipped with microplate reader. The values were expressed as percentage increase of fluorescence intensity versus blank HUVEC (without LDL). The data were analyzed using StatView 4.5 (1992–1996 Abacus Concepts, Inc). Comparisons between and among groups were assessed by one-way ANOVA followed by Fisher's PLSD, respectively. The correlation was calculated by Pearson's method. P-value less than 0.05 was considered as a significant difference. NS wrote and complied the majority of manuscript, was responsible for separation of lipoproteins, determination of oxidative markers and expression of adhesion molecules on HUVEC. PY measured lipoprotein composition. SK, WL, GB and SL were responsible for patient management, sample collection, contribution and analysis of clinical data. RU assisted in in vitro HUVEC culture and measurement of adhesion molecules. The study was supported by the Research Initiative Grant of the Faculty of Science, Mahidol University, and partly supported by the NIH grant NOT-TW-02-001, International Malaria Research Program Award, and NAIAD, USA training grant D43 TW006240 (or A151310).